The joy that springtime brings to my family is immense with a freshly planted organic vegetable and fruit garden that will soon begin producing a bounty of fresh produce for our family. We got lucky that our children enjoy eating most vegetables and they are always open to trying a variety of new recipes. 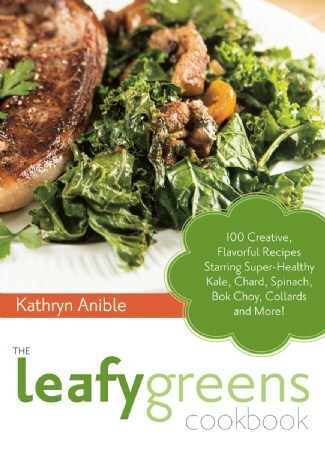 Therefore, I was excited to read The Leafy Greens Cookbook by author, Kathryn Anible. It features 100 interesting recipes highlighting such favorite greens as kale (my personal favorite), chard, spinach, Bok Choy, collards, Brussels sprouts and more. Our favorite recipe from this cookbook so far is the Kale and Chicken Enchiladas which was devoured by my husband and kids. I love that they enjoyed a tasty and nutritious meal that was very easy to make on a busy night. Finally, they enjoyed eating kale in another way then kale chips or raw kale salad. In fact, they liked it so much that the kids asked me to make it for them again a few nights later. I was very excited to find a recipe for cooking dandelion greens which are the very tender in the spring since the only way that I knew how to use this green is in a tea or as a salad. I can’t wait to try the Spicy Sauteed Dandelion Greens which uses just a few simple ingredients such as garlic, red pepper flakes, a sprinkle of sugar, vegetable oil and of course, the star-dandelion greens. It sounds wonderful and I expect this will be the solution for greens that I normally find to bitter but eat because it is packed with nutrients! I really like the format that the author sets up this cookbook which makes it very easy to find a creative recipe to make and that the recipes are simple to follow for even novice cooks (like me). The recipes are divided into sections including the Introduction that I found informative and helpful, Salads and Soups, Appetizers, Snacks, and Sides, Vegetarian Entrees, Poultry, Fish and Meat Entrees and Juices and Smoothies. This is one of those books that I suspect will become well-loved with use as there are so many unique recipes that I think my entire family would like to try. For example, when the vines are bursting with tomatoes I can make the Arugula and Tomato Pizza which sounds divine. While I hope to someday get a juicer, right now we currently drink a lot of fresh healthy smoothies. This book has lots of great ideas and my kids loved the Green Pina Colada Smoothie recipe which was delicious! Available from Ulysses Press, The Leafy Greens Cookbook is available for purchase for the SRP $15.95! You can also find it on Amazon.com. Would love to have this cookbook as we’re planning and planting to #GrowYourOwn food 😉 Thanks, Stacie!!! This sounds interesting…. I would love to win it! That sounds like a great book. Now that the warmer weather is here I’m looking to start eating more greens and am looking for some new ideas.